I’ve really been having a blast with Steve Morris’ scripts for his web-comic The Book Of Monsters. I finished another strip earlier this week, but before I show the strip, I figured I’d let you in on my process for the latest comic and a strip from the previous Book of Monsters post here. The monster for the strip I just finished is the Sphinx, a mythological creature revered in assorted ancient cultures, including Mesopotamia, Egypt and Greece. After reading the script I had to decide how I wanted to interpret the Sphinx for the Book of Monsters to fit the cartoony comic strip style I came up with for Steve’s comic. In doing research I found a lot of suggestive pictures of the sphinx with not only a woman’s head, but also breasts, uncovered supple breasts. That didn’t seem a good direction for the character for a light hearted children’s fantasy series. I considered going for a bookish librarian look with glasses and a bun, but it didn’t seem to have that mythical feel. 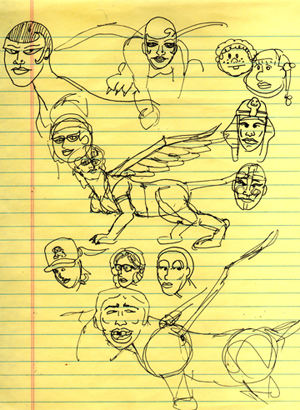 Here are some preliminary sketches of the Sphinx. 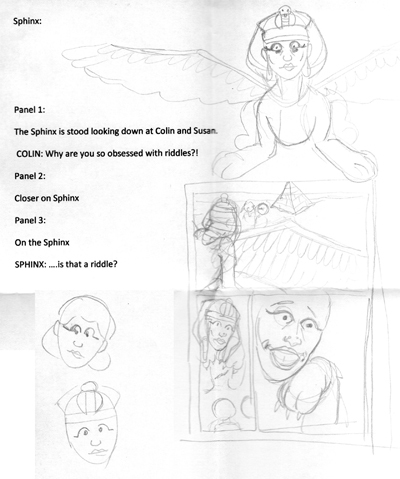 Then having mostly nailed down the Sphinx’s look I looked at the script to see how I wanted to lay out the page. It’s only three panels and two lines of dialog, but I wanted to give a good sense of setting and pace it so the eye doesn’t jump right to the punch-line. 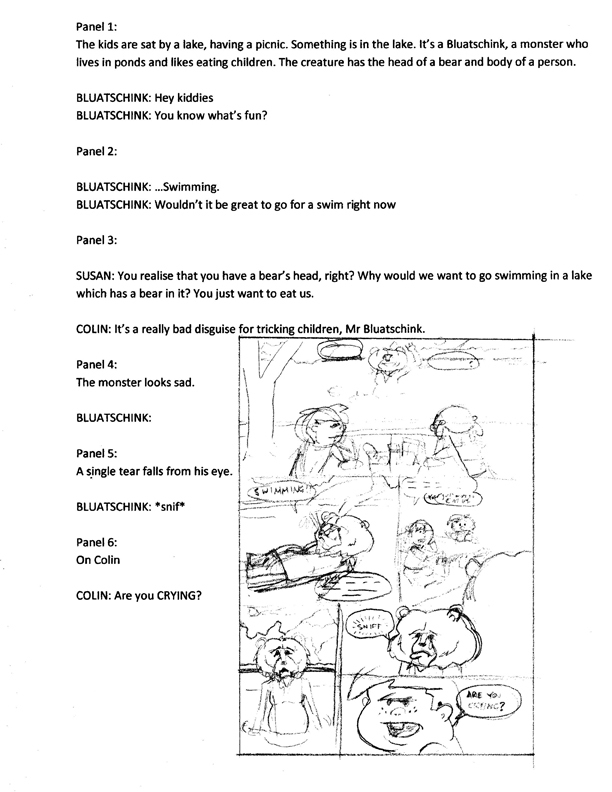 Here’s a look at the script with a rough lay-out, or thumbnail of the strip. 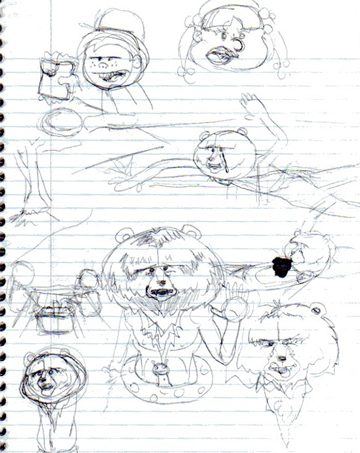 After that I go from the thumbnail to the page, using bristol paper. 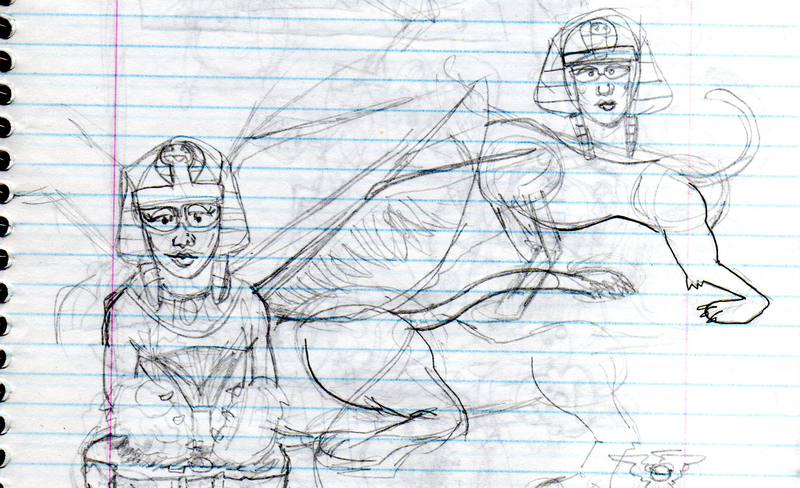 You’ll notice the design changed for the sphinx when I got to the step of drafting the actual strip. I was using a blue lead that isn’t quite non-photo blue, so it got picked up in the scan so I had to go through some tedious clean up. Measuring out the page size to have it scale to comic book proportions of 6.5″ by 10.25″. So after I penciled the page the next step was inking the page. After the first two strips I decided to stop inking the boarders by hand and just stroking the boarders in photoshop with the rectangle selection tool. One of these days I may get a wacom drawing tablet, it should take a few steps out of the process. Here’s a scan of the inked page. Arrggh, so much clean up. After this step, I add color using photoshop and when it looks the way I want I save the .psd and import it into Illustrator to add the lettering. I was saving it as a .jpg before at 300 dpi before I’d do the lettering, but that just needlessly eats up memory. The .psd file is crisp and at a great resolution to add letting on it’s own. Any ways, below is the finished product, Susan and Colin Meet The Sphinx, coming soon to The Book Of Monsters. And as promised the evolution of my favorite monster to draw, the Bluatschink. He’s just the best monster. And you can see the completed strip in the first Book of Monsters post here,and eventually on Steve’s site. Nice blog and very good article….